Belum Valley is located, midway between the East and West Coasts. The nearest towns are Grik in Perak and Jeli in Kelantan which are connected by the scenic East-West Highway. Kuala Lumpur to Belum takes six hours by road. Join the North-South Highway and exit at Kuala Kangsar. Head for Grik and then to Pulau Banding. It is also accessible from Baling in Kedah via Pengkalan Hulu from the north. From Kota Bharu it's a three-hour drive. The nearest railway station is Kuala Kangsar, a long way off. To get to the campsites, arrange for boat transfer with tour operators who normally include the boat fee and entry permit (RM10) in the package. Unfortunately, the operators are not centrally located. For more information on lodging, boat ride, trekking and nature guide, call the Perak State Economic Planning Unit (Tourism) at 05-5225119 or Perhilitan Perak at 05-7911164. The first choice is camping by the lake or river. There are also floating chalets and a few units of chalet at the Orang Asli settlement. However, for something comfortable, Banding Island Resort offers rooms ranging from standard, superior and deluxe with choices of hill or lake view. Rooms are basic with coffee/tea-making facilities. Resort also has a campsite and function rooms equipped with modern audio visual aids. Located at Pulau Banding, the third biggest island in Tasik Temenggor, the resort makes an ideal stop-over for motorists using the East-West Highway. It also offers a host of adventure activities like fishing, kayaking, jungle walking and trekking, bird watching, camping or visiting the Orang Asli settlement. For food, guests have two choices – the air-conditioned Hornbill Restaurant or unpretentious Warung at the lakeside. For more information, call 05-7921791/2 or e-mail banding@tm.net.my. THERE was no warning given that we should prepare for a tough time for this three-day trip to Sara, one of the main valleys in Lower Belum Forest of the Ulu Perak district. Soon we would have to do six hours of jungle trekking in the relatively unexplored rainforests – hunting for rafflesia or bunga pakma, wild ginger blooms and salt licks. But with excitement over the trip running high, we chose to immediately head for the campsite despite our host's offer of spending the night in relative comfort at Banding Island Resort to freshen up after the long drive from Kuala Lumpur. The resort is located on Pulau Banding, the third largest of the 80 or so islands in the 152 sq km Tasik Temenggor, created after the Temenggor Dam was built in 1978. So our nature guide Sulaiman wasted no time in preparing the boat, rations and camping equipment for the night. "Our first stop is Kiroi campsite and tomorrow we will head to Kampung Post Chiong for our rafflesia and salt lick trekking," Sulaiman briefed us. Even though the monsoon has started to show its colours, the water level is surprisingly low at Tasik Temenggor – the second largest man-made lake in the peninsula after Terengganu's Kenyir. While at places the lake can be as deep as 60 metres, the low water level makes the sprawling lake exclusively the domain of experienced and licensed boatmen. The smooth 40-minute boat ride ended with a tricky "docking" manoeuvre during which our boatman Zaidi had to carefully inch the boat between sprouting tree trunks. Kiroi, an Orang Asli settlement site of abundance, was invitingly beautiful. It has a gentle slope of an L-shape grass area facing an inlet at one side and the thick jungle at the other. We set camp at its longest arm with the sight of lonely tree trunks poking out of the placid water. Thanks to the bright half-moon, this beautiful picture gets extra glitter from the shinning stars. The next morning, cold mist awoke us and gave the boost to start our much-awaited hunt, a 20-minute boat ride away to Kampung Post Chiong, a small village of the Temiar tribe. From the kampung, our Orang Asli guide Abus led us into the "jungle" with an easy 20-minute walk along the river bank of Sungai Sara and another 20-minute walk to an old police post. "If not for the low water level, the boat will take us upstream to the police post," Sulaiman said. There is a "straight" trek to the Pering Salt Lick along Sungai Terming, a tributary of Sungai Sara. Since we were in the hunt for rafflesia, Sulaiman made a long way round deeper into the forest. While he insisted it was the normal rafflesia trail, we could hardly make out any signs of a footpath. Hill after hill, we just plodded on through the thick forest, grabbing for anything firm within reach to pull us up or steady our footing. Along the undulating trail, wild ginger blooms and fungus broke the monotony before a dark red bud the size of tennis ball led us to a bigger bud – as big as a dinner plate – awaiting to reach full rafflesia bloom in a week. "Like humans, it takes nine months to reach full bloom from a tiny dot on its specific host, the tetrasigma vines," Sulaiman explained. The buds will help determine the best time for nature lovers to come a-calling, provided that they do not succumb to weather or "alien" substances like salt, perfume or oil. 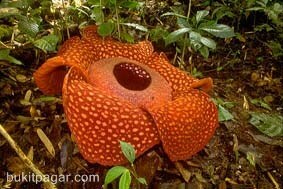 Unlike the rafflesia found in other tropical countries, this parasitic plant in Belum Forest is non-seasonal and bears flowers continuously. Thankfully, the sight of rafflesia gave us renewed energy to finish the trek at the nearest salt lick. This took another hour across Sungai Terming. We could immediately sense the strong smell of sulphur when we reached the three ponds positioned like a cascading waterfall while some eight metres uphill, there were two more ponds with the bigger one of white sulphur. It took only two hours to trek back to our boat at Kampung Post Chiong and Sulaiman tempted us to consider staying on in the resort for a rare encounter with Belum's "treasure". "We can go 'hunting' the wild elephants," he suggested. We couldn't resist and agreed to the night drive on the East-West Highway, looking for the giant mammals as they made their way across the road. However, the excursion only went as far as 15km from the resort. It costs RM30 per van. Just before the second "causeway" of Banding island, we caught the glint of elephant eyes and behold, a huge elephant was busy feeding itself. That was quite a sight. To round up the successful nature expedition, Sulaiman proposed fishing the next morning for the lake is teeming with toman, sebarau, kelah and baung. Well, time to confess we had no luck. Looks like the toman was far too cunning for jungle novices like us. Belum Forest wasn't taking it lying down. That's a challenge we must take up another day.